Wrecking Crew is an action game that was released as part of the NES Black Box series. It contains 100 stages and the objective in each is to demolish the flashing walls, doors and ladders using Mario or Luigi's hammer. The foreman Spike tries to impede your progress, and if an enemy or fireball touches you you'll lose a life. While you can't directly attack opponents, you can knock down pillars to capture them in drums, or send them to the bottom of the level by blowing up dynamite. What might initially seem like a pure action title is just as much of a puzzler, which adds to its depth and stops it from being a mindless destruction game. 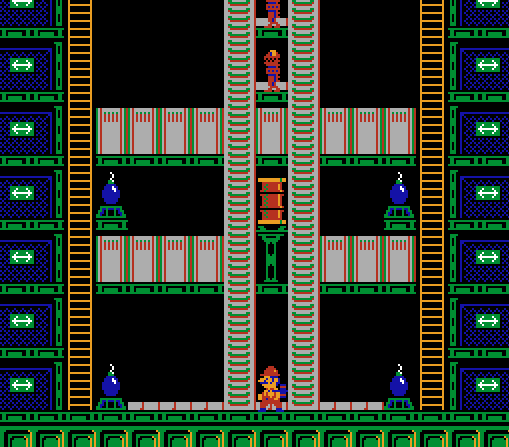 The clever and intricate stages start off basic, but eventually morph into larger areas; I particularly like those that require you to use dynamite to drop platforms and then destroy a previously unbreakable wall. Other enjoyable stages play like a game of dominos, as you hit one beam and watch as carnage happens around you! Some levels can feel impossibly difficult to start with, but with persistence there's usually a snigger-inducing way to blow up a row of enemies and make your life a whole lot easier. Similarly, it's always fun to smash a supporting beam and watch a drum land directly onto a bad guy! Enemies attack non-stop, and the fact that they're always hot on your heels (with no direct way to attack them) gives the game an intense, claustrophobic feel that's perfect for an Arcade style title. The game can be incredibly tough at times, but the ability to select any level from the title screen lessens some of the frustration. The Design mode also allows you to create up to four stages; it's a fantastic addition but unfortunately the Save/Load feature doesn't work. Wrecking Crew is a unique game that manages to successfully blend action and puzzle elements into a fun, cohesive whole. It does get a bit repetitive after a while, but there's a ton of content here and the ability to choose any level, at any time, makes it a great game to return to. Random trivia: The Save/Load feature works on the Famicom version if used alongside the Data Recorder.